Our Mugardos terminal, at the Ferrol port, began to operate in November 2007. It provides the system with a natural gas capacity of 3.6 bcm (billion cubic meters) per year of natural gas (14% of the Spanish natural gas demand for 2014). Its design stands out for the use of cutting-edge solutions that ensure the efficiency of the terminal. Its berth is suitable for the docking of any gas carrier of the world fleet. The unloading arms are connected to two tanks capable of storing up to 300,000 cubic metres of LNG and keeingp liquefied natural gas at a temperature of -160º C at a pressure close to the atmospheric pressure. The stored LNG can be loaded onto ships or trucks or sent to the regasification facilities of the plant. 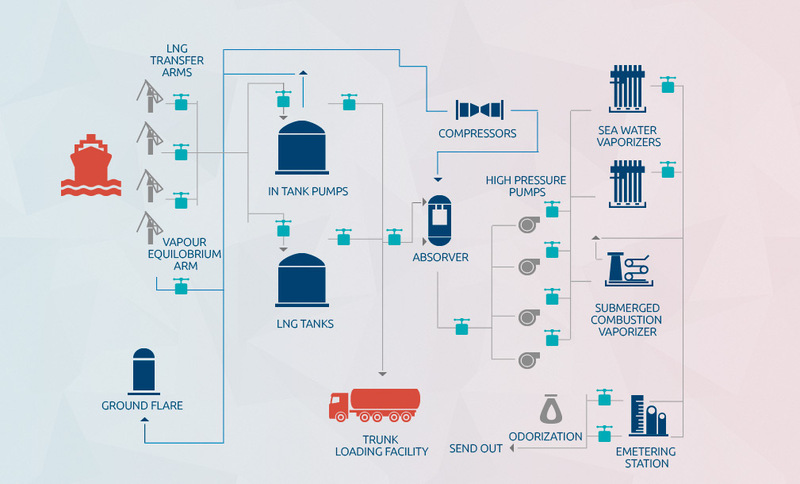 These facilities achieve the phase transition of the LNG to its gaseous state through two sea water vaporizers or a back-up submerged combustion vaporizer. Subsequently, natural gas is injected into the transmission system.